The shattered casements still are there. Bakhchisaray, which literally means palace in a garden, was the capital of the Crimean Khanate from the early 16th century until it was annexed by Russia in 1783. 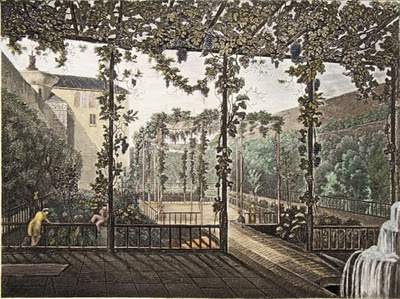 One of few images of its antique gardens is a plate depicting tower-tall arbors (top), from "Meyer's Universum", a compendium of the world published by Carl Joseph Meyer in 1860. The palace was originally built by Mengli Giray in the early 16th century and functioned as both the residence of the Tatar Khans and the administrative headquarters of the Khanate, evolving over time into a complex of buildings and garden courtyards. 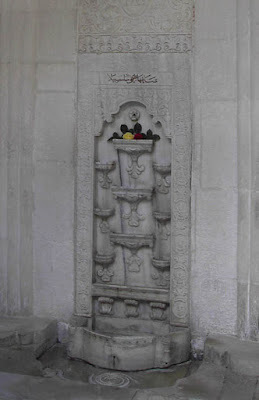 In one still stands the "Fountain of Tears" (c. 1763), immortalized by Puskin in his 1824 poem The Fountain of Bakhchisarai, but attached even prior to the poet's visit with romantic tales of a Khan in love with a captured maid and the eternally weeping fountain he commissioned as a memorial upon her death. 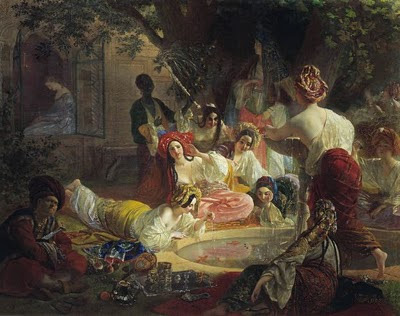 Pushkin makes the heroine a devout Polish girl, sitting aloof from the pleasures of the harem and its garden. Though little known in the West, the story and its setting are beloved in Russia, inspiring in addition to the painting by Karl Briullov a ballet, an opera, and film based on Pushkin's tale. Bakhchisaray is today a museum of Crimean Tatar history and decorative arts. What a great post. Knew nothing about this.